Ortiz Tuna for sale. Buy online at Zingerman's Mail Order. Gourmet Gifts. Food Gifts. Line caught in northern Spain. This is one of the most popular foods we sell. And amazingly, the most popular format we sell is the case of 30 tins. Here in the U.S., tinned tuna is a low-end commodity usually sold in supermarkets. In Spain it’s at the complete opposite of the culinary spectrum. Writing in the New Yorker, Lauren Collins said Spain is "perhaps the only country in the world where it is desirable to serve food that comes in a can." She meant it as a compliment—it's delicious. 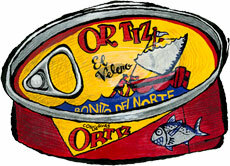 Tuna in tins, especially these from the fourth-generation family firm Ortiz, is one of the jewels in Spain's culinary crown. Ortiz's fish are all line caught—not netted—hand cleaned and tinned in good olive oil. The olive oil is key. It adds flavor and makes the texture silky over time. Most tinned tuna is packed in water which tends to leach flavors from the fish. Bonito—or albacore, as it's commonly known in America—is the most mellow and highly prized species. It gets my vote for top everyday eating tuna. It’s nearly the ultimate in convenience food. A quick turn of the lid, and you can serve it with salads, beans, appetizer platters or on its own, dressed with some top-notch olive oil, a squeeze of lemon and a sprinkling of sea salt. Decades ago, chefs used to select their preferred tuna batches at Ortiz. But it fell out of favor, and no one has done it for years—until we did. Recently Mo and Brad went to Getaria, a fishing village in northern Spain off the Bay of Biscay, to taste all the batches of tuna that Ortiz had tinned for America. We nabbed the most flavorful, a single shoal that resulted in some 40,000 tins. It's even better tuna than we've been able to get before. If you think this all sounds like "adults only," it might be worth knowing that many of our crew's kids are hooked on this tuna. One eight year old I know keeps a case under her bed in case the pantry runs dry. "[My mom] came over and scarfed down all the Ortiz tuna directly from the tin on the cheese board (direct quote: 'WHY IS THIS SO GOOD???')." "We savored Ortiz straight from the can, like caviar."